(12) Thinking of the pleasing and good words of the earth, the king engaged with a calf so that the representative of mankind thus milking obtained all the crops. (13) Everywhere else other men of intelligence also acquired the wealth by likewise caring [for a calf] and thus milking from Prithu's planet earth, whatever they wanted. (14) Oh good one, the sages milking the goddess with their senses [as the milking pot], produced, by dint of sage Brihaspati as the calf, milk in the pure form of the Vedic hymns. (15) Producing from Indra, the king of heaven, as the calf, the godly milked into a golden pot the nectar of the milk of mental power and the strength of the body and the senses. (16) The sons of Diti, the enemies of God, produced with Prahlâda as the calf, with the most important [devotee] among the godless, the milk of fermented and distilled beverages in an iron pot. (17) The singers and denizens of heaven produced with him who was named Vis'vâvasu as the calf, into a vessel in the form of a lotus, the milk of sweet music and beauty. (18) The most fortunate demigods responsible for the funeral rites, with great faith produced, with Aryamâ, from the realm of the ancestors the milk of the offerings of food into an unbaked earthen pot. (19) The perfected souls and the scholars and such [the Vidyâdharas], appointing Kapila as the calf, produced with the ether [as the milking pot] the knowledge of proceeding at will with yogic mystic powers [siddhis]. (20) Others endowed with magical and mystical powers [the Kimpurushas] produced with Maya [a demon] as the calf and with concentration [or dhârana as the milking pot], the milk of the wondrous ability of making the body invisible. (21) The descendants of Kuvera, the demons, the ghosts and the witches [respectively the Yakshas, Râkshasas, Bhûtas and Pis'âcas], who are all habituated to eating meat, with Lord S'iva's incarnation Rudra [Bhûtanâtha] as the calf, milked out a beverage made of blood in a pot of skulls. (22) So also the snakes with and without hoods, the scorpions and the constrictor snakes, produced with Takshaka as the calf, their chief, the milk of poison in the pot of the snake pit. (23-24) The four-legged creatures produced, with the bull carrier of Lord S'iva [Nandi] as the calf, from the green grasses their milk in the pot of the wilderness. The other sharp toothed animals, the predators, with the lion as their calf milked out the flesh of other beings and the birds, with Garuda as their calf, produced in the pot of their own body the milk of the moving [insects and worms] and nonmoving living beings [the plants and grasses]. (25) With the banyan tree as their calf the different trees produced milk in the form of their juices while the hills and mountains, with the Himalayas as the calf, produced the various minerals of their peaks. (26) With the leaders as the calves and with each his own specific milking pot, from the planet Earth ruled by King Prithu the milk was produced of everything needed. Third revised edition, loaded 16 October, 2017. 'Please pacify your anger, oh King, understand that what I said, I have said as someone who as an intelligent person, just like a bumblebee, gathers the essence from everywhere. By the great sages who realized the truth, methods were found and applied for the common people to have a better life in both this world and the next. For anyone who fully follows the principles, that are traditionally taught to the inexperienced who live by their faith, it is very easy to enjoy life. He who in neglect [of the traditions] not properly versed engages on his own initiative, will, in pursuing his goals, see himself fail time and again. Oh King, I see that all the plants that in the past were created by Lord Brahmâ and are cherished by me, are now in the hands of irresponsible people with no respect for the spiritual practice. [With me] not being taken care of and neglected by local rulers like your goodness, I have for this world, that has fallen into thievery, hidden all the herbs and seeds that are needed for the offerings. Because of being hidden within me for such a long time, those plants, fruits and seeds have deteriorated and therefore your Majesty should take them out the way it is prescribed. Oh hero, arrange for a calf for me. And if you also arrange for a milking pot and a milkman, I will, from my affection for it, fulfill all your desires in the form of milk for each of you. I will also, oh mighty-armed one, oh protector of the living beings, if you want, provide for the food you desired to feed yourself. Thinking of the pleasing and good words of the earth, the king engaged with a calf so that the representative of mankind thus milking obtained all the crops. Everywhere else other men of intelligence also acquired the wealth by likewise caring [for a calf] and thus milking from Prithu's planet earth, whatever they wanted. Oh good one, the sages milking the goddess with their senses [as the milking pot], produced, by dint of sage Brihaspati as the calf, milk in the pure form of the Vedic hymns. Producing from Indra, the king of heaven, as the calf, the godly milked into a golden pot the nectar of the milk of mental power and the strength of the body and the senses. The sons of Diti, the enemies of God, produced with Prahlâda as the calf, with the most important [devotee] among the godless, the milk of fermented and distilled beverages in an iron pot. The singers and denizens of heaven produced with him who was named Vis'vâvasu as the calf, into a vessel in the form of a lotus, the milk of sweet music and beauty. The most fortunate demigods responsible for the funeral rites, with great faith produced, with Aryamâ, from the realm of the ancestors the milk of the offerings of food into an unbaked earthen pot. The perfected souls and the scholars and such [the Vidyâdharas], appointing Kapila as the calf, produced with the ether [as the milking pot] the knowledge of proceeding at will with yogic mystic powers [siddhis]. Others endowed with magical and mystical powers [the Kimpurushas] produced with Maya [a demon] as the calf and with concentration [or dhârana as the milking pot], the milk of the wondrous ability of making the body invisible. The descendants of Kuvera, the demons, the ghosts and the witches [respectively the Yakshas, Râkshasas, Bhûtas and Pis'âcas], who are all habituated to eating meat, with Lord S'iva's incarnation Rudra [Bhûtanâtha] as the calf, milked out a beverage made of blood in a pot of skulls. So also the snakes with and without hoods, the scorpions and the constrictor snakes, produced with Takshaka as the calf, their chief, the milk of poison in the pot of the snake pit. The four-legged creatures produced, with the bull carrier of Lord S'iva [Nandi] as the calf, from the green grasses their milk in the pot of the wilderness. The other sharp toothed animals, the predators, with the lion as their calf milked out the flesh of other beings and the birds, with Garuda as their calf, produced in the pot of their own body the milk of the moving [insects and worms] and nonmoving living beings [the plants and grasses]. With the banyan tree as their calf the different trees produced milk in the form of their juices while the hills and mountains, with the Himalayas as the calf, produced the various minerals of their peaks. With the leaders as the calves and with each his own specific milking pot, from the planet Earth ruled by King Prithu the milk was produced of everything needed. Oh chief of the Kurus, milking the earth with the different calfs, pots and milkers, thus by Prithu and the others following his example, the milk was obtained of all the different forms of food needed by the living entities. King Prithu, being very pleased with all desirables produced as milk, full of affection thereafter treated the planet earth as if she was his own daughter. The emperor, the mighty son of Vena, with the power of his bow had broken up all the hilltops of the entire earth and thus had leveled [cultivated] her almost completely. And so the Supreme Lord, present on this earth as the son of Vena, was as a father to the citizens in employing them and in preparing at different locations for numbers of suitable dwellings according to the need: villages, cities, settlements and forts of different kinds as also habitations for the milkmen, pens for livestock, camps, mines, agricultural towns and mountain hamlets. 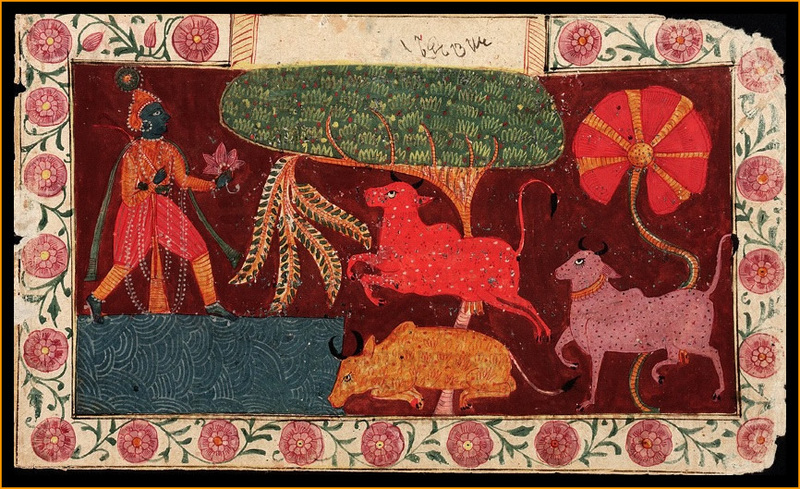 The classical painting shows Krishna and His cows. Artist unknown.